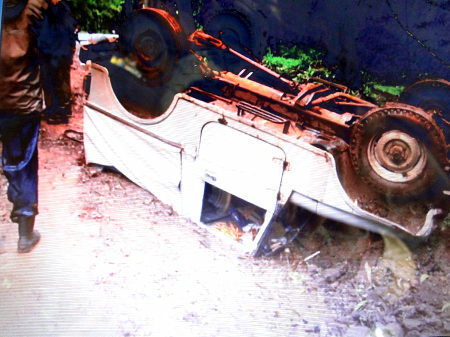 It was a lucky escape for the six forest officers who met with an accident as their jeep toppled upside down near Jamboti village. The forest officers along with another jeep were escorting the captured leopard to the Bhimgad forest reserve, on a turn to dodge the motorcycle coming from the opposite side the driver lost control and the jeep tumbled upside down. The injured have been identified as driver Ganesh Madiwalkar, Deputy RFO Mahesh Tallur, guards – Ramesh Gavade, Kadayya Matpati, Kalmesh Bagi and Shrinivas Nilgar. All the officers escaped with minor injuries. It may be recalled that they were on a rescue mission to leave the captured leopard who had attacked a home in Chikale village yesterday.